Formulating with Food - Is That Even Doable? Wouldn't it be great if we could safely extract and capture the very essence of a fresh vegetable or fruit and use it in a skin care product without needing any pricey lab equipment? There are things to consider, and other things to be aware of. To answer a few questions you've posed me about formulating with 'real, natural food', I decided to make a product using one of my favorite ingredients - cucumber. I chose cucumber for this experiment because my skin loves cucumber - in seemingly every form. Cucumber extract and cucumber seed oil are staples in my stock. Fresh cucumber juice is my first choice for almost every face mask. Deciding to create a soothing, fresh-cucumber eye serum (or 2) took me about a nanosecond and a half. I made 2 different cucumber juices to discover what worked best: with or without peel. My preferred cucumber juicing method: grate cucumber into a lined sieve and allow it to strain. The sieve was lined with 4-double silk jersey (I used an old silk t-shirt, but might just as well have used doubled up nylon stocking or muslin cloth). 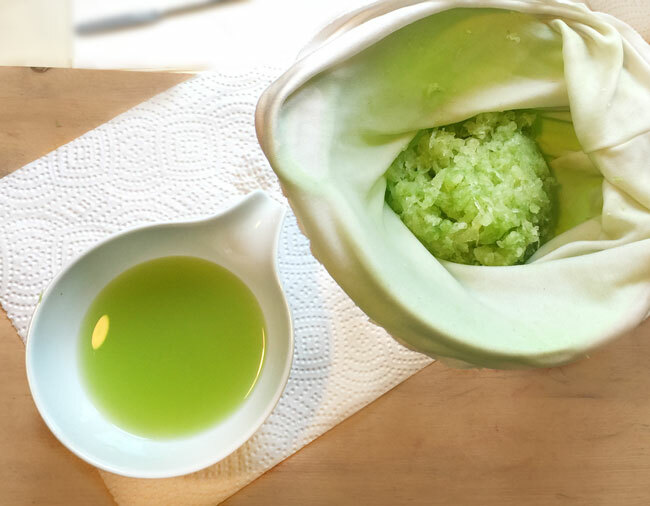 When using cucumber juice in a mask, the mixture is squeezed to extract all the juice. This time, I wanted the juice as clear as possible, so there was no squeezing or pressing of the material. After straining, both juices were filtered an additional 6 times through coffee filters. Why 6 times? Why not 2 or 20? One reason only: I stopped filtering when there was no visible residue in the filter. 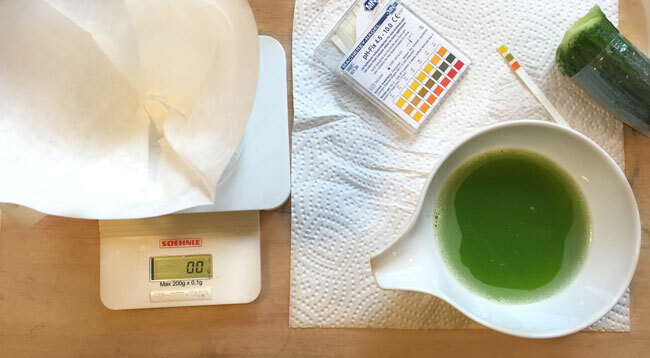 The top picture is the batch with the peel included (prior to the final filterings), the bottom picture is the peeled cucumber batch after filterings. The difference in the juice color is huge, don't you agree? Both batches were preserved immediately after straining. Broad spectrum preservation is an absolute must with a formula of this nature. Normally, I would reach for my never-fail cocktail of ethylparaben, methylparaben and phenoexethynol. However, it is normally added during the water-phase of an emulsion (read: to a heated mixture). This eye serum is a cold-mix formula, and since benzyl alcohol is added at cool-down, it was used for both batches. 2 Identical batches were made where the only difference was the cucumber juice. Next time, we'll have a peek at how the eye serums turned out, how the cucumber behaved and if there any surprises. Hint: of course there were surprises-- one can't do something like this without experiencing a few surprises. Have you ever tried using a fresh food in a (preserved) skin care product? What did you use and how did it turn out? Please share! I've used fresh basil and fresh ginger in my lotions,and there where no problems with them. In my soaps I've used mango, banana, carrot juice, lemon juice, orange juice and chocolate at least. ...I forgot, I've also used goat milk, both in soaps and lotions and it was wonderful. Hi Signe - Ah yes, soap is indeed a place where many have experimented with the addition of food with all kinds of good results. I'm interested in your lotions with ginger and basil-- did the scent stay stable? I've also used fresh food, but instead of juicing, if made a glycerin extract. I have succeeded in doing it with cucumber, strawberry and pineapple. I simply cut the fresh fruit and cover in glycerine. I dose at 5% max. I like this form because I can prepare it with the seasonal food when they are nice and ripe. What an excellent idea! How long do you let the food infuse in the glycerine? Hi, Lise - I didn't notice any changes in scents of my lotions, but I use them quite quickly and not storing them too long time. And use preservative, of course. Hey lise! It’s always a pleasure going through your blogs and experiments . Just a quick question - do you think this type of fresh juice lotion or serum would pass a stability and challenge test?? Do you think any natural broad spectrum preservative could possibly preserve product made of fresh food (fruits and veg or milk ) .... (I know with glycerites it’s possible but juice ??? ) how long could be the shelf life of this types of serum. Hi Sahishta- Thank you for your comment! If you do a search you’ll see the next post about this answers your question. Fresh juices from fruits and veg are preservable but there are additional issues (unavoidable oxidation will cause color change) that make this option a real challenge.